Day 58 Motorhoming in Spain … to the garage and back again! Well today has been a strange day, strange but good, even if it didn’t have the outcome we were hoping for. We received a call from the garage yesterday morning, asking us to drive Harry over there so they could try and work out what was wrong with him with all the wires connected and the Electroblock in situ. This morning was spent, tying things down, making sure that everything was in it’s place and not too much rattling would occur whilst driving the 50 ish kilometres over to Estepona. Before leaving we had a quick look at our check list to make sure we hadn’t forgotten anything, like closing off the gas, checking the roof lights were closed and various other bits and bobs. We set off, and as it is at least three weeks, it was strange to be back up in an elevated position and I think the Hubster found somewhat of a change after driving the tiny little Hyundai hire car for a couple of weeks, here he was back up behind Harry’s goldfish bowl windscreen. The road to Estepona is the A7 which is a dual carriage way, so it’s long and straight, so that wasn’t a problem. The problem with this road is that everyone seems to break the speed limit, it’s extremely busy and the access to the road isn’t like the slip roads in England where you can edge on to the road at a decent speed, the access is more of a “T Junction” meaning you have to wait for a gap and hit the road running, in a car not so much of a problem, however in a 3.5 ton motorhome it is quite a different story, we just don’t have the acceleration so as you join the traffic your heart is in your mouth hoping and praying that the cars behind realise that we are just not going to get up to speed! What was in the back of my mind was a phrase that our new, English neighbours had said to me this morning “Beware, just remember they’re all out to kill you here! There are no niceties on the road, just Evil!” Had we not been here for a while, I would’ve agreed but maybe we’re just getting used to it! We managed and got to the garage early so we decided to pop to Lidl to do our shopping and after as we’re were done we sat in the car park and had a coffee, it was strange, there was a time when we would never have spent spare time just sitting drinking a coffee, we always seemed to be chomping at the bit going from one thing to another. We arrived at the garage where Jose and Dr Willy were waiting for us, a few minutes later the ‘Electronics Man’ turned up, he got into the van and I’m not sure what he did but the outcome was that he took the box away with him and Jose explained that he was going to repair it but it wouldn’t be ready until tomorrow, could we come back tomorrow? Of course, no problem we said. Jose and Dr Willy presented us with these two rather fetching hats which I shall wear around the camp site, if it’s advertising they need I’ll do it with pleasure, They have been absolutely fabulous and so helpful and understanding. As we went to leave we realised the automatic steps were in the ‘out’ position and of course we couldn’t retract them as the ‘magic box’ had been whisked away! Jose and Dr Willy spent another 30 minutes trying to find the wires, plug them into a car battery to get a charge and eventually they did retract but we can’t use them at all now! There was a moment when we all thought we were going to spend the night in the compound!! Fortunately not and here we are back at the campsite. Boy, this episode has really made me appreciate how lucky we are and how much we normally take for granted! I’m quite sure this is going to be such a worthy experience that we’ll be able to call back on time and time again in the future. For the moment, however, I am sat here, with my glass of Rose Wine and a bowl of crisps, the sun is going down and it’s decidedly dim! However, a lack of light won’t stop us, we’ll still have a game of cards and a hot meal. So before it gets too dark, I’ll bid you farewell and hope that soon (tomorrow) all may just be back to normal. 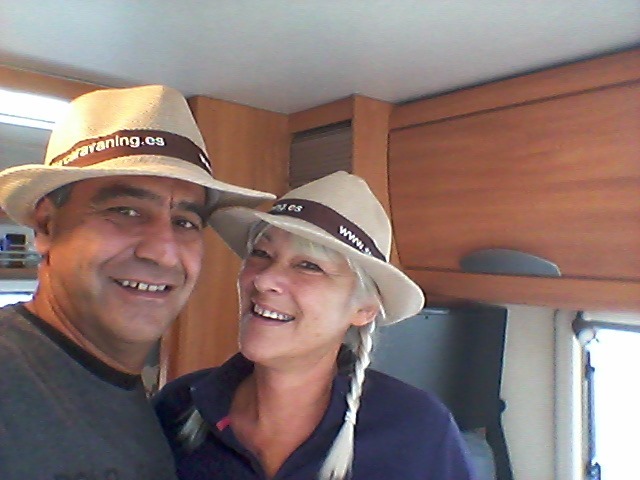 This entry was posted in Daily life, Hidden Gypsy, Hymer, motorhome, motorhoming, Motorhoming in Spain, Photos, Spain, Thoughts and tagged driving in spain, Estepona, hidden gypsy, Hymer, motorhome, Motorhome breakdown in Spain, motorhoming in Spain, Spanish Mechanics, Surcaravaning. Bookmark the permalink. What an adventure you’re having, and blessedly you’re choosing to see the bright side. It makes all the difference in the world. May you be blessed. Oh how right you are! By the way are you sorted out yet or are you still stuck in Normandy?